In a theoretical paper, H. L. Seldon (2005) puts forth an explanation for human cognitive abilities, which he calls the “balloon hypothesis”. Seldon’s argument, briefly, is that upregulation of white matter production (especially phospholipids) is the main driving force behind the expansion of human cortex, which he describes as like inflating a balloon. The surface of the balloon is the gray matter, which is composed of cortical columns. As the balloon inflates, cortical columns spread further apart. Seldon postulates that the thinning of gray matter and separation of cortical columns increases the precision of brain processing by increasing “differentiation capacity”, the ability to differentiate incoming signals. This increased precision in differentiation of perceptual signals, according to the model, is the basis of both cognitive abilities and unique psychological disorders found in humans. Seldon’s hypothesis rests on many claims: brain expansion is tied to cortical thinning; cortical thinning is responsible for ‘expertise’ and is synonymous with cortical maturation; that cortical columns are spaced further apart during cortical thinning; and that cortical columns function more efficiently when spaced further apart (presumably, allowing for greater intercolumnar inhibition and increasing the signal-to-noise ratio). Hubel and Wiesel’s ice cube tray model. From Horton and Adams (2010); originally adapted from Hubel et al. (1976). As it is not possible to address all of these claims in a single essay, I will focus on cortical columns (including “minicolumns” and “hypercolumns”). The concept of the cortical column is a source of controversy in itself. I will explore the following questions: What is the current understanding of the structure of cortical columns? How do columns vary across primate species, or across mammals in general? What do we know about the function of the cortical column? What areas of research are currently lacking? On the way, I will also comment on whether this information supports or contradicts the balloon hypothesis. In addition to the Seldon papers (2005; 2006); I will examine the following: two review articles, one supporting the concept of cortical columns (Da Costa and Martin, 2010) and one rejecting the concept (Horton and Adams, 2011); Herculano-Houzel and colleagues’ (2008) paper examining diversity in cortical thickness and neuronal density in primate species; and several other papers which rely on the assumption of the validity and/or universality of cortical columns. Mountcastle (1957) first described the cortical column based on electrophysiological recordings in cat cortex. He found discrete boundaries to receptive fields in somatosensory cortex, specifically “light touch” and “light skin pressure”. These vertical columns extended from layers 2-6 with diameters of 30-50 μm; Mountcastle postulated that these columns made up the entire cortical surface. Later studies by Mountcastle and Powell (Mountcastle and Powell, 1959a,b; Powell and Mountcastle, 1959a,b) supported the model. Rhesus macaques showed the same pattern; electrode recordings perpendicular to the cortical surface were ‘modality pure’ while those which deviated in angle showed modality change. Hubel and Wiesel’s classic experiments combined anatomy with physiology, adding evidence to the cortical column model. They described ocular dominance columns (Hubel and Wiesel, 1965) and orientation columns (Hubel and Wiesel, 1963), each of different sizes (.5 vs. .1 μm). Hubel and Wiesel did not, however, see somatotopy as inherently reliant on parcellation into columns; and interpreted Mountcastle’s model as being inappropriate for “continuous” percepts like somatosensation (da Costa and Martin, 2010). Hubel and Wiesel concluded from a comprehensive study on macaques and cats that primary visual cortex (V1) is organized into hypercolumns, which contain columns coding for orientation and ocular dominance. They speculated that other portions of cortex are likely organized in a similar way. Generalizing the model to association areas like language is less clear, since it is not obvious how information would be diced up, whereas in other primary sensory areas, it is easier to speculate (Hubel and Wiesel, 1977). Later, Rockel and co-workers (1980) argued that cortical columns are characterized by a specific number of neurons (approximately 110), which has contributed to the notion that these columns are uniform across cortex. Rats appear to lack cortical columns in V1 (Girman et al., 1999) although column like structures appear in whisker barrel cortex. 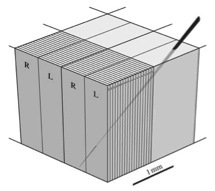 Da Costa and Martin speculate that whisker barrel columns are fundamentally different from primate (and other mammal) V1 columns because they are very uniform, unlike primate V1 columns, which come in a heterogeneous patchwork-like organization. Da Costa and Martin suggest that the reason for this is that primate V1 columns show more “emergent” properties. Although barrel cortex is more regular, this could be the result of physiological practicalities; i.e., whiskers are more sensation-isolated from one another than orientation specific photoreceptors. Presumably, whiskers are usually stimulated as a group, but it would not be uncommon for one whisker to be stimulated independently. It would likely be very difficult for one set of photoreceptors, whose outputs are organized into orientation columns, to be completely independent from another set. From Da Costa and Martin, 2010. The canonical microcircuit. The authors propose replacing the notion of columns with a basic microcircuit. 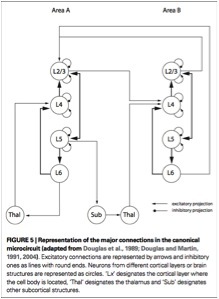 Da Costa and Martin propose that repeated local circuits (fig. 2), rather than columns, should be emphasized. The reason for the emphasis is that it avoids other types of morphological constraints implicit in the column model (e.g., columns are always cylinder-shaped; columns must contain 100-odd neurons). Instead, Da Costa and Martin suggest focusing on the features of the circuit, which vary in number of neurons and shape of vertical column (like the pinwheels seen in visual cortex to the apparent “disorganization” of rodent V1). Features which distinguish this canonical microcircuit include the following: external inhibition and internal excitation; relative inhibitory thresholds based on network activity; and dynamic reweighting of inputs based on their degree of pattern matching with the excitatory connections in the circuit. structural features provide which functions. Seldon (2006) investigated hemispheric differences in columnar spacing in order to address the question of whether hemispheric specializations correlated with columnar structure. He found wider inter-column intervals in left temporal lobe, which he suggests could be responsible for language specializations in this region. Seldon also hypothesized that left parietal lobe would have increased intervals, but his data did not support this. It is interesting to note that other workers have found wider minicolumns in the left hemisphere of humans compared to apes (Wernicke’s area, Buxhoeveden and Casanova 2000; Broca’s area; Schencker et al., 2008); perhaps greater inter-column distance does provide some advantage for language processing. Raghanti and co-workers examined the characteristics of inhibitory interneurons and minicolumns from a comparative perspective. Using the apical dendrite bundle as the diagnostic feature, they found in their review that macaque monkeys had a small minicolumn width in V1 (23-30 μm) compared to rats (35 μm), rabbits (45 μm) and cats (57.5 μm). Possibly this reflects neuropil space more than the “core” (Casanova et al., 2009), or, perhaps small minicolumns are a primate specialization. Interestingly, small minicolumns were also reported in cetaceans by several authors (Morgane et al., 1988; Manger; 2006, Hof and Van der Gucht; 2007). It is tempting to speculate that large-brained mammals may share small minicolumns as a feature of their organization, similar to mirror neurons. The organization of cortical columns in the visual cortex and presumably other areas provide an efficient way to organize incoming information, which is part of the appeal of the concept. How useful is the cortical column in understanding brain function? Herculano-Houzel and co-workers (2007) describe cortical columns in the same breath as modules. They suggest that increased brain size means an increase in cortical columns or “columnar modules”. Yet “module” is loaded term – psychologists use it to describe theoretical functional compartments (e.g., a language module; a tool-use module; a morality module). If cortical columns are processing units, it is understandable that we might generalize the concept of module to describe their function. However, it seems unlikely that a single cortical column handles the amount of processing as a ‘module’. Perhaps groups of columns coalesce structurally and functionally to form modules. If this is the case, we need more rigorous definition of terms, because the increase in the number of columns would not necessarily have any bearing on the number of modules. For example, larger-brained species could simply have greater numbers of columns/module, but the same number of modules. Conversely, modules could have set column numbers, and thus greater numbers of columns would necessarily mean more modules. Another possible scenario is that modules are more fluid, like a series of Venn diagrams; a module could overlap with another module (one could a imagine, for example, that a tool-use module would overlap with a semantic-type module). Thus, describing modules and columns in the same breath confounds the issue of brain size and its role in cognition. As described earlier, the concept of cortical columns is far from definitive. Modules are even more theoretical, usually the domain of anthropology and cognitive psychology. While divisions between closely related disciplines are undesirable, there are some cases where the levels of description are far enough from each other (at least for the moment) that segregating the theoretical discussions is important to avoid confusion. Horton and Adams (2005) go so far as to dismiss the concept of the cortical column as unsubstantiated. They argue that either 1) there is no such thing as a cortical column, or 2) if such a structure does exist, it does not perform any specific function. Of Horton and Adams’ claims, the second is less tenable on the surface. While evolution certainly is known for spandrels, a unifying, complex, repeating organizational basis for cortical structure is an unlikely candidate. The first claim is an important challenge and not so easily dismissible. Even Da Costa and Martin (2010) revive Hubel and Wiesel’s debate on orientation columns – the observation that dendritic arbors can extend several millimeters parallel to the cortical surface, whereas orientation columns are an order of magnitude smaller (30 μm) at the largest. This poses a problem for isolated cortical processing that is presumed in the cortical column model. Horton and Adams point to local tracer injection studies, which they describe as labeling a “diffuse cloud” of neurites extending half a millimeter across. Surely cortical columns should have visible, physical borders in this preparation? Even While I find Horton and Adams’ skepticism compelling in light of the confusion regarding nomenclature and definitive anatomical detail, this concern is flawed for two reasons – first, functional and even structural organization into columns does not necessitate that columns exist in a vacuum – some interconnectivity is bound to be present. Second, and perhaps more importantly, interneurons, contributing inhibition between columns, and therefore critical to the function of the column, are necessarily present between columns. Relevant to this issue, Hubel and Wiesel, looking at ocular dominance columns, did find less than perfect specificity within each column. It appears the ocular dominance columns had the greatest specificity in layer 4. Moving superficially or deeply from layer 4 resulted in greater cross talk, suggesting that despite the interconnectivity between columns, layer 4 may maintain the independent organization of the column. In contrast, orientation columns respond as if there is no interconnectivity (Hubel and Wiesel, 1968). 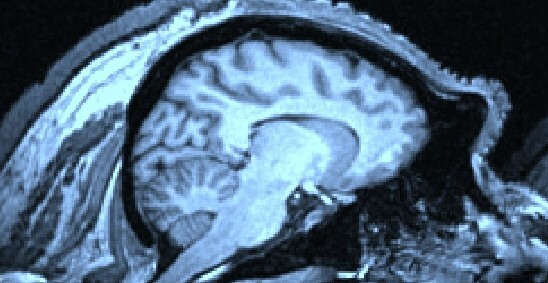 Further in their thesis, Horton and Adams focus their criticism on the confusion caused by minicolumns and cortical columns. The terms do seem to be used interchangeably, and different authors use different definitions or diagnostics to describe both. This problem can confound anatomical studies of column size as well as cloud the issue of the ultimate function of the cortical column as a discrete, fundamental unit of cortex. Mountcastle (1997) argued that minicolumns are interconnected to form columns, the latter termed by Buxhoeveden and Casanova as “macrocolumns”. However, Horton and Adams argue that the specifics of the mini- and macrocolumn organization are far too hazy – how many minicolumns constitute a macrocolumn? Instead of throwing out the baby with the bathwater, Da Costa and Martin suggest rethinking the ‘cortical column’ concept. Rather than thinking of the column as a rigid, isolated, uniform structure, they suggest a looser interpretation wherein “cortical columns” refer to the vertical organization of cortex, which can be columnar, or other shapes (some more amorphous than others) and which can be more or less isolated. They argue the term has value because previous to the concept, neuroscientists were not considering the possibility of horizontal cortical organization, and instead only discussed laminar structure. Several theoretical issues have been identified here which require new lines of research. It appears a recurring problem is the isolation of datasets. We know cortical column size and organization in some areas of cortex (mainly V1) but not others. We know the way they operate in some species. We know general principles of how far dendritic arbors extend between columns, but again, there appears to be a lack of exhaustive information on the subject. Ideally, we’d like to know the entire package of information for a single region of cortex, instead of compiling a series of generalizations from different studies, using different methods, in different regions and different species. A more thorough description of column anatomy, compared across cortical regions in humans and our close relatives, is essential if we would like to look for human specializations. Comparing association cortices to primary cortices would be useful here – presumably the ground level of perception requires different forms of processing than higher-level association processing (Fuster 2004). Moreover, there may be differences in areas responsible for perceptual associative processing (temporoparietal cortex) or executive types of associative processing (premotor cortex, prefrontal cortex). Lastly, it is important to disambiguate columns from modules from a structural point of view. Seldon’s model relies on multilayered assumptions. One of the crucial assumptions is that cortical columns function more efficiently when there is greater inter-columnar inhibition. To determine whether or not this is correct is a complex task and currently impossible to address for the following reasons: First, we do not have a comprehensive anatomical description of cortical columns across all, or even most, cortical areas in humans. Next, if we did, this would still leave the question of whether human cortical columns are spaced further apart than in other species. The lack of comparative data on this subject is a fundamental problem. Third, if these data were available, and let us for the sake of argument assume that humans have greater spacing between columns (ignoring Raghanti’s findings for the moment), it would not necessarily follow that the columnar spacing is responsible for human cognitive abilities. Neanderthal (L) and human (R) crania. Note the lower forehead of the Neanderthal. human brain suggests a large, “puffy” chimpanzee or macaque brain. One is tempted to postulate that perhaps Neanderthals, with their sloping, bottom-heavy brains (fig. 3), had less balloon-like brains, ergo, less economic computation than Homo sapiens, despite equal or larger brain volumes. Given the complexity of the cortical column, the heterogeneity of its structure, and recent data suggesting neuronal density actually increases at a faster rate than surface area, the balloon hypothesis is flawed. This does not mean that the cortical column or microcircuit itself is not a critical piece of the puzzle to understanding human cognition. Perhaps greater neuronal density means greater absolute numbers of cortical columns, or larger columns, or both? Does association cortex have a fundamentally different form of cortical column that can be distinguished from primary cortices? If so, it would suggest that association cortex is doing something fundamentally different from primary cortex in terms of processing or inference – leading to many questions about what makes association cortex unique, and how this feature may have fundamentally changed human cognition as it expanded. Could selection pressure have somehow acted directly on association cortex (perhaps through genes that influence development)? How is computation different in the association cortex? When did this evolutionary breakthrough occur, and what may have spawned it? The Perception-Action Cycle. From Fuster (2005). If these columns or microcircuits do not have important structural differences between regions, this would raise different questions. Size and shape of columns and hypercolumns may vary, but perhaps, as argued by Da Costa and Martin, an essential microcircuit is ubiquitous. If so, one could assume that computation is computation – it can be fundamentally broken down into more-or-less homogenous building blocks. In this case, selection pressure might not have to be as specific – just crank out more tissue! Or perhaps, make more brain in the right area, for example, in the temporal lobe so we can link auditory and visual inputs and create richer semantic meaning. Fuster’s perception-action cycle (fig. 4; Fuster, 2005) suggests that the hierarchy and connectivity is crucial to function, and not the local structure of the building blocks. In other words, perhaps it is the association and integration of the circuits that creates specialization of function, and the circuits themselves are relatively interchangeable. AI researchers are looking to the cortical column as a basis for intelligent systems. For example, Markram’s Big Blue Project (Markram, 2006) is an effort to create a large-scale computational simulation of a single rodent cortical column, with the explicit goal of creating an artificial intelligence by 2020. Markram is simulating dendritic arbors only, in an attempt to create a biologically based model. Hashmi and Lipasti (2009), on the other hand, suggest that the microcircuit of the cortical column can be used, along with an understanding of neuronal network function (downweighting, upweighting, long-term depression, and long term potentiation) to create computational models of intelligence. Further, the authors are able to demonstrate learning and selective forgetting of information using their system, without detailed knowledge of the connectivity of cortical microcircuits, or modeling of individual neurons. Perhaps computational models will provide another line of evidence, along with ongoing anatomical and functional work, to help us understand the degree to which the cortical column, or microcircuit, is a fundamental building block of cortex. Adams DL; Sincich LC; and Horton JC. 2007. Complete pattern of ocular dominance columns in human primary visual cortex. Journal of Neuroscience 27:10391–10403. Buxhoeveden D; Casanova M. 2000. Comparative lateralization patterns in the language area of human, chimpanzee, and rhesus monkey brains. 5: 315-330. Buxhoeveden DP et al. 2006 Reduced minicolumns in the frontal cortex of patients with autism. Neuropathology and Applied Neurobiology 32: 483–491. CasagrandeVA; Harting JK. 1975. Transneuronal transport of tritiated fucose and proline in the visual pathways of the tree shrew (Tupaia glis). Brain Research 9: 367-372. Casanova MF; Trippe J; Tillquist C; Switala AE. 2009. Morphometric variability of minicolumns in the striate cortex of Homo sapiens, Macaca mulatta, and Pan troglodytes. Journal of Anatomy 214:226–234. Drager UC 1974. Autoradiography of tritiated proline and fucose transported trans- neuronally from the eye to the visual cortex in pigmented and albino mice. Brain Research 82: 284-292. Drager UC. I975. Receptive fields of single cells and topography in mouse visual cortex. Journal of Comparative Neurology 160: 269-290. Eberhard JP, Wanner A, Wittum G. 2006. NeuGen: A tool for the generation of realistic morphology of cortical neurons and neural networks in 3D. Neurocomputing 70: 327-342. Girman SV; Sauve Y; Lund RD. 1999. Receptive field properties of single neurons in rat primary visual cortex. Journal of Neurophysiology 82: 301–311. Hof PR; Van der Gucht E. 2007. Structure of the cerebral cortex of the humpback whale, Megaptera novaeangliae (Cetacea, Mysticeti, Balaenopteridae). Anatomical Records 290: 1–31. Horton JC; Adams DL. 2005. The cortical column: a structure without function. Philosophical Transactions of the Royal Society – Biological Sciences 360: 837-862. Hubel DH; Wiesel TN. 1963. Shape and arrangement of columns in cat’s striate cortex. Journal of Physiology 165: 559–568. Hubel DH; Wiesel TN. 1965. Binocular interaction in striate cortex of kittens reared with artificial squint. Journal of Neurophysiology 28: 1041–1059. Hubel DH; Wiesel TN. 1977. Ferrier lecture. Functional architecture of macaque monkey visual cortex. Proceedings of the Royal Society London, B, Biological Sciences 198: 1–59. Krieger P; Kuner T; Sakmann B. 2007. Synaptic connections between layer 5B pyramidal neurons in mouse somatosensory cortex are independent of apical dendrite bundling. Journal of Neuroscience 27: 11473–11482. Manger PR. 2006. An examination of cetacean brain structure with a novel hypothesis correlating thermogenesis to the evolution of a big brain. Biological Reviews 81: 293–338. Markram H. 2006. The blue brain project. Nature Reviews Neuroscience 7: 153–160. Morgane PJ; Glezer II; Jacobs MS. 1988. Visual cortex of the dolphin: an image analysis study. Journal of Comparative Neurology 273: 3–25. Mountcastle VB. 1957. Modality and topographic properties of single neurons of cat’s somatic sensory cortex. Journal of Neurophysiology 20: 408–434. Mountcastle VB; Powell TP. 1959a. 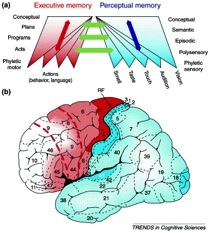 Central nervous mechanisms subserv- ing position sense and kinesthesis. Bulletin Johns Hopkins Hospital 105: 173–200. Mountcastle VB; Powell TP. 1959b. Neural mechanisms sub- serving cutaneous sensibility, with special reference to the role of afferent inhibition in sensory perception and discrimination. Bulletin Johns Hopkins Hospital 105: 201–232. Raghanti MA; Spocter MA; Butti C; Hof PR; Sherwood CC. 2010. A comparative perspective on minicolumns and inhibitory GABAergic interneurons in the neocortex. Frontiers in Neuroanatomy 4: 1-10. Powell TP; Mountcastle VB. 1959a. Some aspects of the functional organization of the cortex of the postcentral gyrus of the monkey: a correlation of findings obtained in a single unit analysis with cytoarchitecture. Bulletin Johns Hopkins Hospital 105: 133–162. Powell TP; Mountcastle VB. 1959b. The cytoarchitecture of the postcentral gyrus of the monkey Macaca mulatta. Bulletin Johns Hopkins Hospital 105: 108–131. Rakic P. 1988. Specification of cerebral cortical areas. Science 241: 170 –176. Seldon HL. 2006. Cortical laminar thickness and column spacing in human temporal and inferior parietal lobes: Intra-individual anatomical relations. 11: 226-250. This entry was posted in Cognition, Cortex, cortical columns, Evolutionary neuroscience, History of Neuroscience, Human evolution, Sensory perception. Bookmark the permalink. I saw this on google Plus. Wow! What great information and so clear. I am very cozy on this now. I was looking for an explanation of current thought on minicolumns after having seen Rakic’s paper and a similar but more damning one by Harpaz. Your article fulfilled my need very nicely. Guess I’ll stay tuned. Wonder if things have changed much since you posted this over two years ago. In any case, thanks.